Emotionally – This will be the most difficult thing to prepare for. While there are things you can do to prepare for the amputation emotionally, it is impossible to know how you will react when you actually see the missing leg. 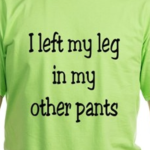 Most amputees need to grieve the loss of the limb. I already grieved the loss of use of my leg well before the amputation, so found I didn’t need to grieve the loss of the leg itself. It is completely natural to have good days and bad days. 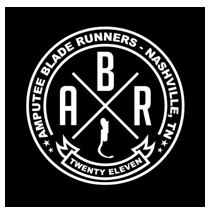 There are resources out there and your hospital or prosthetist will probably have a list of resources and a list of amputees in your area that are willing to come and talk to you. My best advice is “attitude is everything”. It is very important to have a positive attitude about the amputation and that it is going to improve your life, not end it. It was my positive attitude that got me through and the reason I didn’t fall apart emotionally. A psychologist can be very valuable in helping you to prepare emotionally for the amputation. They can provide some methods for dealing with this kind of trauma, they can guide you with your thoughts and most of all they are there to listen to you. Prepare your family. If you have kids the subject of your amputation needs to be common conversation in your home. I discussed it at every opportunity I could find. 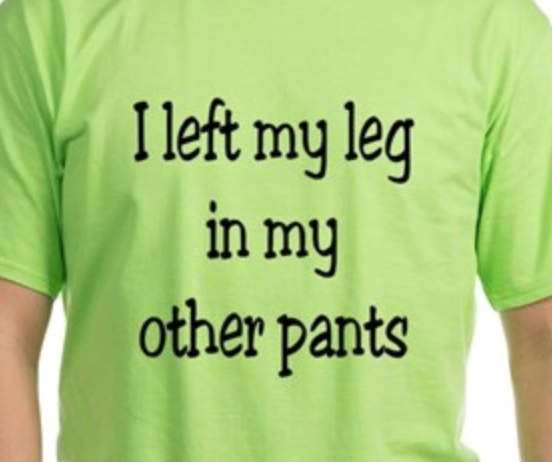 The words “having my leg amputated” became as common as the phrase “please pass the salt.” I educated them in every way I could – I showed them pictures of what the stump would look like, joked about being one legged and laughed with them about tricks we could play on trick-or-treaters on Halloween with the amputation. I also recommend naming your stump, kids love that. My wife began calling mine “Stumpy” months before the surgery. If you have real young kids I suggest finding child-appropriate stories to read them that cover the leg amputation topic. I would also suggest contacting your local hospital or prosthetic center to see if they have a peer mentoring list. It might be helpful to find an amputee to meet your young child. If my kids had reacted in a scared manner to me it would have done me in. Do not make the amputation a family secret; get it out on the table and discussed as part of your daily family life. Keep open communication about the amputation with your spouse or partner. They will be your caretaker in the first weeks and this will forever change their lives as well. Help them prepare for not only your needs, but theirs as well. It is impossible to know how you will react after the surgery. Even if you go into the surgery feeling prepared to handle the aftermath, you could fall apart when you see the stump. I was very fortunate that I had the strength to handle the whole process with a positive attitude. The best advice I can give is “attitude is everything” – get in the right mindset and be determined to maintain a positive attitude from the planning stages until the end of this journey, which will be your death at 95+ years old. Amputation will forever change your life, so the challenge is for life, but with the correct attitude, hard work and determination your life will be productive and rewarding. My philosophy – if it needed to be done and I could find an adaptable way to complete the task, I found it and did it. I amazed myself many times in what I was able to accomplish with one leg. With this mindset I did not sit around waiting for the prosthetic leg to resume my life. I fully engaged back into a full and productive life well before even beginning the prosthesis process. Click here to read my Sense of humor post. Help is only a message away! Send me a message by using my contact button, private message me through my Facebook page or Twitter. I would love to chat with you! Bathroom – The bathroom was one of the areas in the house that I found to be the most difficult to deal with, with the obvious obstacle being the shower. Make sure you have your shower set up so you don’t have to hop and balance on one leg. 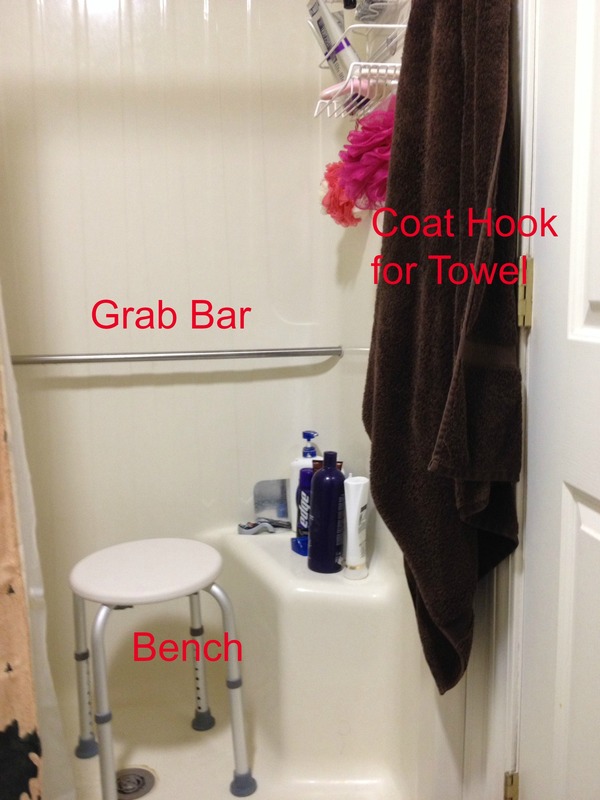 Have a grab bar installed, get a shower bench to sit on, install a hook outside the shower that is reachable from the shower bench to keep your towel and have a non-slip bath mat outside the shower. Within no time, with these items in place you will be able to shower independently. My shower routine: I use my crutches to get to the shower. I then turn using my crutches so my back is to the shower and remove my bathrobe. I then place my crutches so I will have easy access to them when shower is completed. Next I reach back and take hold of the grab bar in shower. 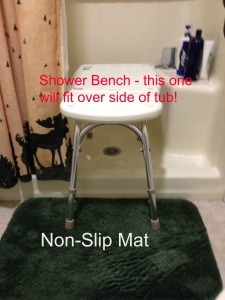 I then carefully sit on the shower bench. When the shower is finished I reach out, grab my towel and dry off before standing. I then pull myself up using the grab bar, seize my crutches, throw on my robe and go. I also recommend that you have a grab bar placed on the wall next to the toilet to aid you in sitting and rising. Remove any rugs or mats from the floor that don’t have a rubber non-slip backing. Also, remove loose rugs or mats from areas where they are not needed, otherwise they will be tripping hazards. The only mat that should be in your bathroom is a non-slip mat in front of the shower. Be prepared; the bathroom was the one area I got the most upset in. It’s very degrading when a necessary natural human function becomes so difficult. Some of the simplest things you never gave thought to will become obstacles that can bring you to tears. My house was already set up for ultimate independence for a crutch-dependent person. 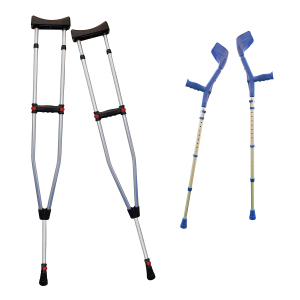 Crutches – If you are not experienced with using a pair of crutches, get a pair and learn to use them. Your ability to use a pair of crutches will make your recovery so much easier. (Crutch haters hear me out, please!) Not only will they provide the most efficient way to ambulate, but they will also aid in your overall health. Plain and simple, sitting 24/7 is just not healthy. The crutches allow you to stand and be vertical. You will have better blood flow, you will have less stump pain and you will be more physically fit when it comes time to learn to use the prosthesis. The best way I found to relieve my phantom pain was to grab my crutches and go for a walk. Another thing that your ability to ambulate on crutches will help with is the Functional Levels Evaluation. This is an evaluation that you may have to go through at some point to determine the level of prosthetic leg you will receive. Often the insurance companies require this evaluation to decide what level of leg they will pay for. If you have spent the past six weeks sitting in a wheelchair your overall physical ability is going to have decreased, making it difficult to perform the tasks necessary to pass the evaluation i.e. if they feel you are willing to sit in a wheelchair they might only pay for a basic functioning leg. I cannot stress enough how much the ability to use a pair of crutches can improve your life following a leg amputation. 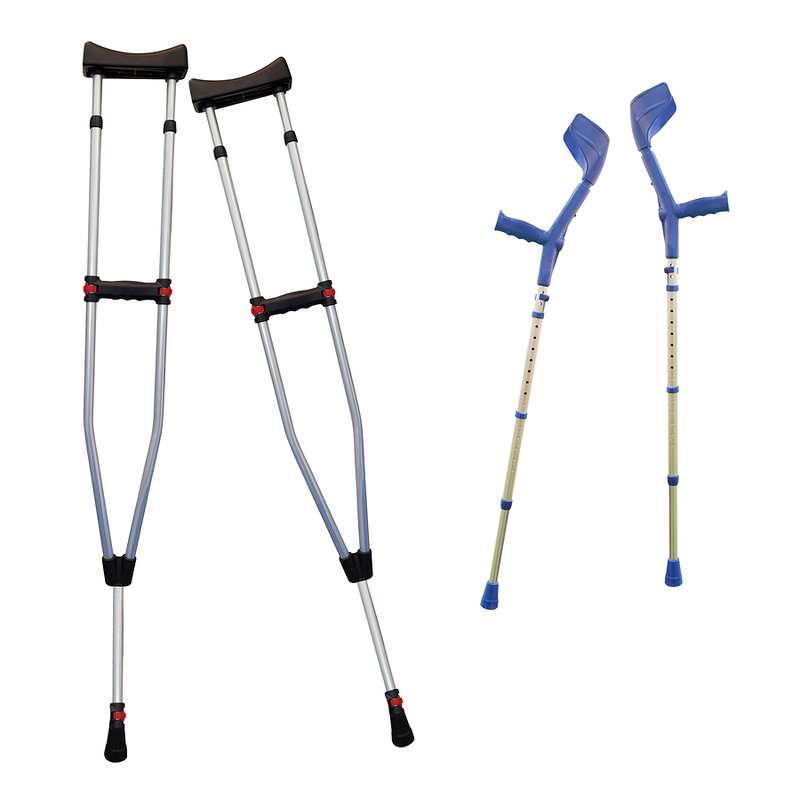 If you do not have any physical or health problems that would prevent you from learning to use crutches, get a pair and put the work in to becoming efficient on them. The payoff will be huge. My crutches are tools that have greatly improved the quality of my life. * I do understand that there are physical health conditions that make it impossible to use crutches. Click here to visit my review of crutches and for tips on becoming comfortable on your crutches. The following is from an article from the Amputee Coalitions inMotion newsletter. 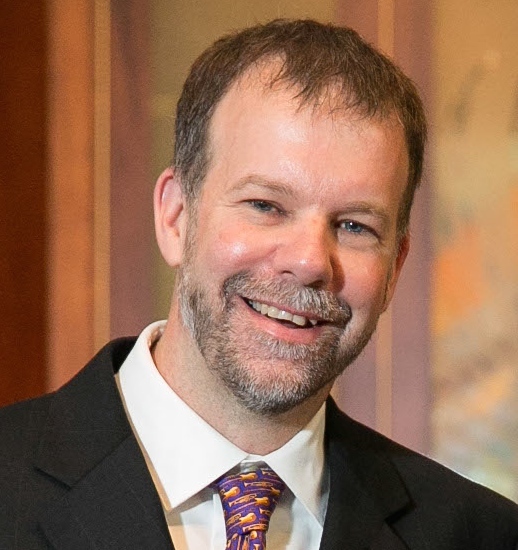 “Everyone who has been confronted with a lower-extremity amputation has had to make decisions regarding mobility options. Many amputees opt for a prosthesis as their primary mode, wearing it (or them) full-time. Some prefer wearing their prosthesis part-time or for specific activities. In either scenario, the “must-have” equipment, the most important aid that a single-leg amputee could ever invest in, is a pair of appropriate crutches. Click here to take a look at my crutch tricks and tips page for ideas on making your home crutch-friendly.